Tokai Forum - a subsidiary of TokaiRegistry.com :: View topic - Tokai tube amps? Although I am a Matamp fan and owner I cannot belive for the life of me that Jeff at Matamp still insists on putting those cheap handles on his cabinets. Well I suppose I can he is a typical Tyke (tight). Must admit I was less than impressed my self with this model when I visited the factory while one was on soak and heard Hayden (bulldpog pickups) play through it. My Matamp First Lady may have been ?300 more than one of these but it sounds 3000% better. I've got a Matamp Little Rock and the Spirit doesn't match up to that at present. The amp, as I mentioned in an earlier thread doesn't have that good clean tone, but when pushed with a Hughes and Kettner Tube Factor it comes to life. The spirit combo is basically a Minimat Mk1 amp within the NOS Tokai cabinet. Research on the Matamp Forum shows that other Minimat users have also noted that the amp has better tone when pushed with an overdrive or treble booster. (from Jeff) The mod is to change the capacitor on the tone pot in to a lower value e.g. 4n7. If pushed Jeff would also say that the Little Rock is also the worst amp Matamp have ever made, nothing more than a toy in fact. I am very sorry, re reading my previous post I come across as dissing your Little Rock. I ment nothing of the sort. The name Matokai etched on the circuit board would go some way to confirm that the amps are a hybrid Tokai and Matamp. Photo's of the amp would be really great. 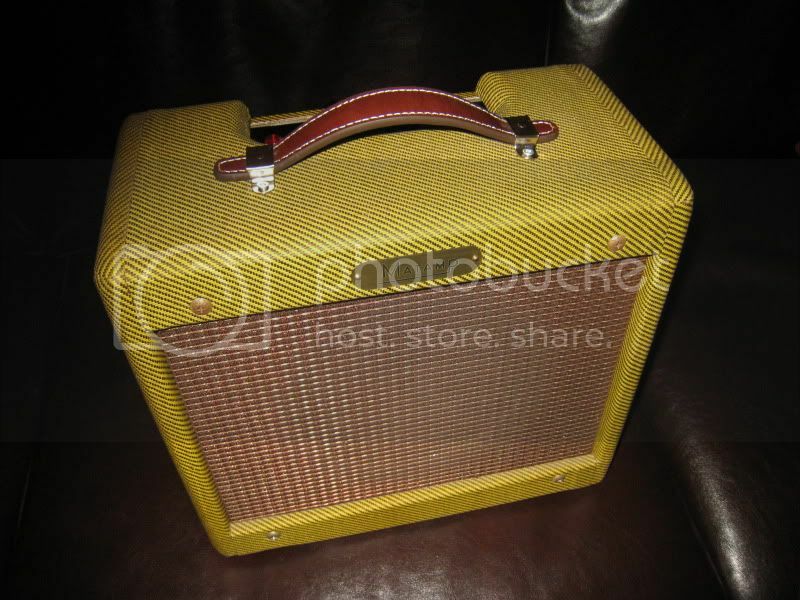 As I mentioned in my earlier posting, the amp I saw at the North West Guitar show was one like yours, with reverb. It sounded great with the a Nigel Crinson relic tele going through it. hey chrisheyes, yep i can get some pictures together this afternoon! i don't really use photobucket, is there a way to put them straight into this thread? if not i'll upload to my myspace pictures and then post a link. that wont create any problems will it? i've been on forums before that wont let you link myspace or personally created music! just spotted a surf green tele copy that would match up with it nicely...well...in a sickly 50's sweet-shop kinda way! Photobucket enables you to embed photo's/ images into the posting, you don't have to click on a link. I use it as it easier for the reader, they don;t have to click on a link. however, if you can't do that, then a link to where they are is fine. i really didn't do that right did i! sorry, pretty new to this! Posted: Wed Aug 18, 2010 8:29 am Post subject: there we go! The additional line outs for 16 and 8 ohm speaker cabinets are a bonus on yours, they're not on my version. thanks for the kind words dude, its a great little amp! sounds great through a 12 cab! its not quite a tokai but i've just turned an old tele copy into an esquire and it sits with the amp beautifully...yucky surf green to really pump up the kitsch! i don't need the 16 ohm out or the foot switch so i'm hoping to get a tech friend (its a little above me!) to add a line out with dummy load and an attenuator...fun fun fun! Matamp already make an external attenuator for ?45+ p&p !! Get in touch with them and they'll sort you out.